Alternative setting: Jungle Taitei: Susume Leo! Writing reviews is not really my thing, but since there are none for this movie, I will give it a shot. Jungle Emperor Leo is a children's movie, so if you are looking for action, you can just close this tab. The characters and plot are simple, so if you are rather mature, you probably won't be particularly carried away by this movie. If you on the other hand are a little hung-over or tired, and don't feel like watching the next episode of some heavy, disturbing series - this might just fit your needs. The story was o.k. in my opinion. It started off interesting, with fine character introductions and so on. Then, when it started to really go somewhere, it went into all these different and unrelated directions, and some of which didn't really finish in the end. Putting that aside, at least it wasn't as predictable as I had feared. Also I liked the setting and the main storyline. At the terms of art, this isn't really one of those movies that i can tell you to watch, just because it's a beautiful viewing experience. The character designs on some of the animals didn't really fit, and there were sceneries that could've been made a little more detailed. On the other hand, the character designs at least were pretty original. I especially liked the art in the last couple of scenes. It should be mentioned that this was made the previous century. That taken in consideration, it wasn't all that bad. I haven't really got that much to say about the use of sound in this movie. The music was nice, and used at the right times. No flaws in particular comes to mind. The voice actors in the japanese audio were also good and convincing. For a children's movie, I found the depth of the characters to be rather fitting. There were some apparent stereotypes, which is to be expected, but not those annoying ones at that. I must say that I liked some of the humans that were presented, although some of the characters weren't really properly fleshed out. To sum things up, this was a fairly entertaining movie. It was rather apparent that it is meant for children, and I would say that I think I would've enjoyed it more if I were a little younger. It wasn't a total waste of time, but I won't recommend you to watch it either. It is too lacking storywise for me to do so. The art and sound was fair, but nothing more, and the overall impression is nothing much to speak of. I cried. 2 times. All 3 times I've watched this film. So I cried a total of 6 times. Jeez. This film is outstanding. The characters are good, the story is great, the animation is awesome, everything. 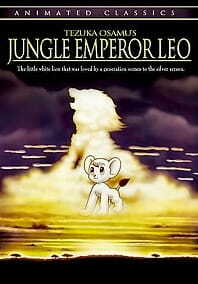 I'd recommend watching a few episodes of the 1989 series first, but this was my first introduction to Jungle Emperor Leo, so I think it stands well on its own. The only bad part? It ended too early. Nothing to do there I guess. Some of the character moments could have been better at the beginning of the film, but it's fine. I don't want to spoil any of the movie so this review is short. What was with that ending??? ?